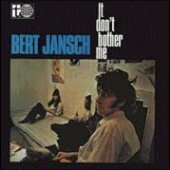 Basically an extension of his 1965 debut, Jansch's second album is perhaps a bit lighter in mood and doesn't boast quite as strong material, although it's nearly in the same league. Includes one of his most explicitly political songs ("Anti-Apartheid"), his first recording with John Renbourn ("Lucky Thirteen," a Renbourn original), and his first use of banjo on record ("900 Miles"). The Demon reissue of this album adds four bonus tracks: a couple of songs cut around this time that only appeared on the obscure Transatlantic LP Box Of Love - The Bert Jansch Sampler Volume 2 in 1972, and the two vocal tracks from Jansch's mostly instrumental 1966 album with John Renbourn, Bert And John. Bert Jansch - Guitar and Vocals.